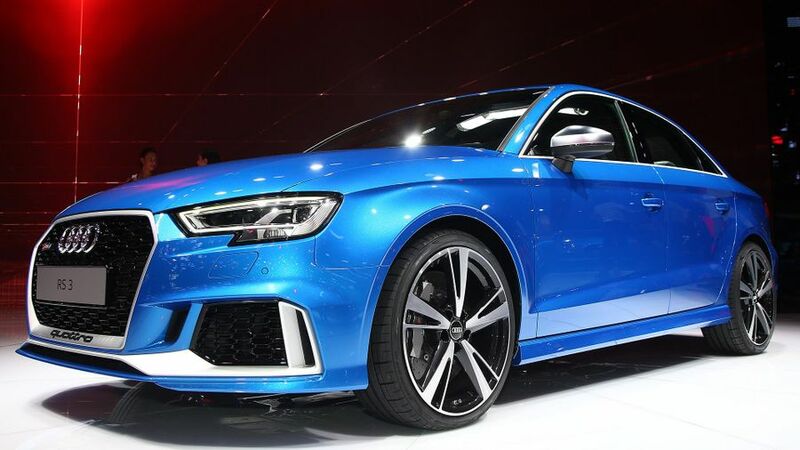 Audi has revealed its new four-door Audi RS3 saloon at the Paris Motor Show. Should the BMW M2 be worried? The new car uses the same 394bhp (33bhp more than the outgoing RS3 Sportback) five-cylinder 2.5-litre engine as the Audi TT RS. Thanks to the new aluminium crankcase, the engine is 26kgs lighter than it used to be, and it is seriously fast. It will be able to do the 0-62mph sprint in a claimed 4.1 seconds, with a limited top speed of 155mph (this can be raised to 174mph on request). The engine’s paired with a seven-speed dual clutch gearbox. Those specs compare nicely with BMW's mini 'M' car - the RS3 saloon has one less cylinder, an less torque, but more power, and two extra driven wheels, so it should be significantly quicker in a straight-line drag race. However off-the-line pace was never the RS3's problem - so will this revised model handle the corners any better than its predecessor? Audi has also had a play around with its patented Quattro four-wheel drive system, splitting the power by up to 100 per cent between the front and rear axle, and shifting more shove to the rear tyres in the sportier settings. And all that is changeable at the touch of a button – switching between driving modes. Still, I wouldn't hold your breath for the kind of smokey slides possible in the M2 or the Ford Focus RS, with it's 'Drift Mode' and trick four-wheel drive system. Looks wise, it’s basically the same as the Audi S3 saloon, apart from the gaping front bumper, new grille, flared wheelarches and a pair of wide oval twin exhaust pipes from the RS3 Sportback. To us though, there's something just a little cooler about the new saloon body - like it's the spiritual successor to the RS4. Inside, there’s plenty of connectivity, including Apple CarPlay, Android Auto, and things like Google Earth. That’s accessible via a 12.3-inch high resolution monitor. Audi’s Virtual Cockpit is available as an option, along with lots of safety kit. The interior will feature leather trim, and an Alcantara covered steering wheel, and Audi's trademark high quality materials. There’s no confirmation on final prices and spec yet, but it’s likely to go on sale for a bit more than £43,000. Fingers crossed these changes will lead to some improvements in the RS3 formula, which came last in our Hot Hatch Mega Test earlier this year.